Former diplomats Jack Segal and Karen Puschel have managed to stay connected with the international diplomatic world after their move to northern Michigan. TRAVERSE CITY – Jack Segal knew it had the potential to get ugly. 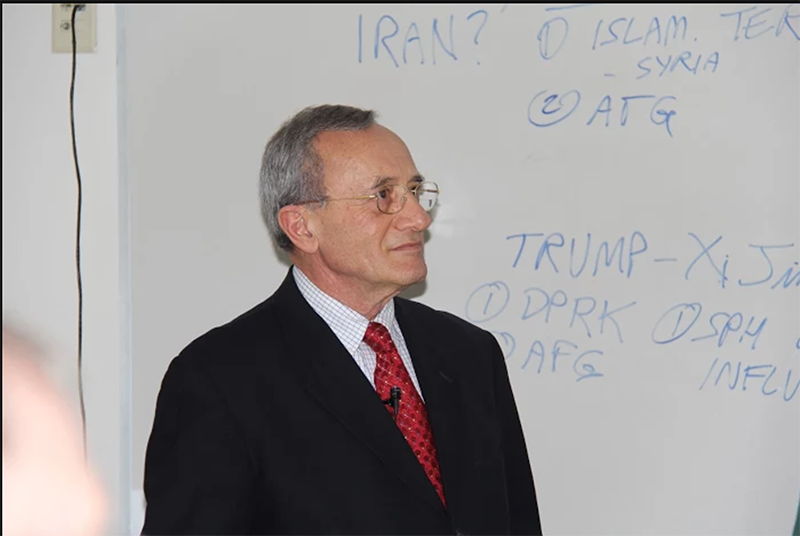 One month into the new president’s administration, the retired diplomat was giving back-to-back lectures on the foreign policy challenges Donald Trump was facing after a rocky first month in office. Both lectures (the second was added after the first quickly reached capacity) packed about 50 adults into a basement classroom. The short, soft-spoken Philadelphia native looked like he could be dressed for a state dinner, in his wire-rimmed glasses and dark, neatly tailored suit. A tiny microphone under his lapel carried his voice. It was as if a minister has shushed her congregation. Everyone at attention, he then offered his insights about Russia and Vladimir Putin, China and Xi Jinping, North Korea’s provocative ballistic missile launches, the Middle East and Trump’s early diplomatic moves. Segal stayed on message and avoided observations that might have seemed partisan. His audience followed suit, more interested in hearing Segal’s perspective than barking out their own opinions. 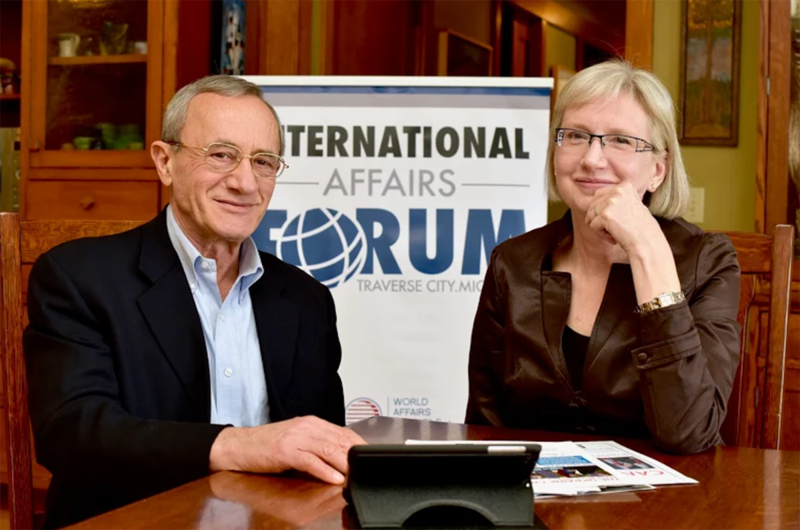 A dispassionate analysis of political and world events has been a guiding force for Segal and his wife, Karen Puschel, since they took over the International Affairs Forum of Traverse City in 2012. The lectures their group sponsors routinely sell out and, in a region that can be fiercely divided in its politics, the couple and the speakers they bring in have managed to be at once fair-minded and thought-provoking in ways that promote discussion rather than shouting. It’s not always easy. Puschel, also a retired diplomat, said the controversy Trump’s nascent presidency already has generated sometimes makes it difficult to walk the line. U.S. Army 1965-77: U.S. Army, two tours in Vietnam, infantry and parachute, left as a captain; Bronze Star and Meritorious Service Medals for Vietnam service. Education: B.A., Boston University, international relations; M.A., University of Southern California, international relations. Career: Specialized early and late in career at U.S. State Department in nuclear security and disarmament; represented State Department in START nuclear arms reduction treaty negotiations with Russia; military/political adviser in Israel during Intifada (Palestinian uprising) and Gulf War; opened new U.S. embassy in Siberia after fall of Soviet Union; member, White House National Security Council 1998-2000 under President Bill Clinton; NATO political/military adviser to a top NATO commander in Afghanistan after 9/11. Current: Co-chair, International Affairs Forum of Traverse City; adjunct professor, Northwestern Michigan College, frequent speaker and lecturer. “U.S.-Israeli Strategic Cooperation in the Post-Cold War Era: An American Perspective”; executive assistant to U.S. Ambassador Thomas Pickering, the first ambassador to Russia after the fall of the U.S.S.R.; opened new U.S. embassy in Siberia. Current: Co-chair, International Affairs Forum of Traverse City; frequent speaker on foreign affairs issues in northwestern Michigan. One upside to Trump’s election, she said, is a greater interest in IAF. Under the couple’s leadership, IAF has flourished with most of its eight annual lectures sold out for an impressive array of speakers. Meanwhile, Puschel, who does the heavy organizational lifting, has added quick-response “Global Hot Spots” presentations to the mix when crises like an Ebola outbreak or Syrian refugees suggest it. Their programs have also meant greater outreach to local students and teachers, who get free tickets to events and compete in IAF-sponsored quiz bowls that test their knowledge of international issues. After careers that took them from Washington to Israel to Moscow to Siberia, and ended with Segal in Afghanistan, Segal and Puschel are firm believers that diplomacy usually trumps bullets. Both worked on nuclear weapons security during their careers. Among those in the audience for the Trump lecture, which was not part of the IAF series, was Mike Nelson, who moved from Iowa to retire in Traverse City and had no idea he’d find Segal, Puschel and IAF in this bucolic corner of northern Michigan. He said he has been to all of Segal’s presidential lectures. “Jack brings an insider’s view and he tries very hard to be nonpartisan,” said Nelson. That’s important in a place like Northwest Michigan, which brings together the mostly progressive community of Traverse City with a Trump-supporting region that surrounds it. In an interview with Bridge, Segal was less guarded about Trump, saying he fears the new president’s foreign policy is focused only on building military might at the expense of diplomacy, as illustrated by Trump’s recent budget proposal to cut State Department spending by 30 percent. A day before the Trump lectures, Segal and Puschel said they talked for three hours about nuclear issues on their drive to Holland and Grand Rapids where Segal was lecturing on the subject. Today, 29 years into their marriage, with only a shoestring budget and a small cast of volunteers, those same discussions fill lecture halls. Segal is the more public face of IAF, enjoying a diplomat’s version of local rock star status on the streets and in the coffee shops of his new hometown. Puschel works with an 18-member board that reflects both the longtime local business and academic talent in the community, as well as other former diplomats, military leaders, auto executives and journalists who have settled in the region. “We all have in common an abiding interest in intellectual engagement and global issues,” Puschel said. Before Segal and Puschel took over, interest and membership in IAF’s lecture series was flagging. Membership has more than doubled since 2004 from 150 to 340, as has the program’s budget, from $19,000 to $44,000. Most of the increase began with the 2013-14 season, Puschel said. Member’s pay $75 for eight lectures, nonmembers can buy tickets for $10. Recent speakers include Steven Simon, former White House director for the Middle East; retired U.S. Navy Rear Admiral David Titley, who discussed challenges to U.S. security linked to climate change; Sally Howell, director of the University of Michigan-Dearborn Center for Arab American Studies; and Robert Ford, former U.S. ambassador to Syria. Other speakers have included leading academics on international issues, a U.S. citizen held hostage in Iran, and prize-winning journalists. Most IAF’s supporters are retirees, Puschel said, but increasingly she’s seen diversity in the audience, including people who have worked overseas and are younger. Based on the book “America in Retreat” by Wall Street Journal columnist Bret Stephens, the film asks whether U.S. movement away from its role as policeman of the world threatens an international stability that has generally prevailed since World War II. After the showing, Segal led an audience discussion that included the filmmakers. Dave Petrove, a Traverse City area peace and environmental activist, suggested that the film was propaganda and that its creators were warmongers; others wondered aloud how the U.S., with so many of its own people in need, could afford to keep intervening in issues half a world away; still others appreciated the film’s message. What most seemed to please Segal was the apparent understanding of the audience that foreign policy and its implementation are complicated and sometimes fraught beyond comprehension. Segal gave the audience important context on U.S. defense spending — which doesn’t include nuclear weapons and Homeland Security: The U.S. spends more than the seven next-largest-spending nations on defense, and the $54 billion defense budget increase proposed by President Trump almost reaches Russia’s annual total defense spending. A voice in the audience also noted that the Trump budget proposed more than a 30-percent cut in the State Department’s budget, to which Segal suggested everyone write their members of Congress to protest. “There was plenty of good argument on both sides of these issues,” Segal said of reaction to the film. The film also was a vehicle to raise donations to help the Petoskey High School team which won the local IAF-sponsored Academic World Quest to travel to Washington in April for the national competition. It was the fourth year IAF sponsored the quiz bowl-type competition, that this year pitted teams totalling more than 80 students from 10 northwest Michigan high schools against each other to answer questions on global issues. Filmgoers donated $2,000, Puschel said. Besides IAF events, Segal and Puschel often accept speaking invitations to local groups. Segal is an adjunct professor at Northwestern Michigan College, home to his presidential lectures. The classes are often filled within a day of their postings. He counted former Michigan Gov. William Milliken, a Traverse City native and resident, among the students in a three-day, nine-hour class examining President Barack Obama’s foreign policy. The predecessor of Traverse City-based IAF was the World Affairs Symposium, which began in the 1950s at the Leelanau School, a coed college-prep boarding school in Glen Arbor. For a week each August, those interested in global issues enrolled for the symposium and lived at the school. In 1992, the symposiums ended and its coordinator at the time, Philip Cochran, formed IAF. After marrying in 1989, Segal and Puschel moved to Tel Aviv, where Segal was assigned as a State Department military and political adviser to Israel during the Palestinian uprising known as the Intifada. Puschel, who had been a fellow with the Council on Foreign Relations in 1987, was awarded a grant from the U.S. Institute of Peace to write a book about U.S.-Israeli relations. In 1991, months after the Gulf War began, Saddam Hussein ordered nighttime scud missile attacks on Tel Aviv. Puschel and Segal carried their gas masks everywhere during the day and returned to their apartment building before dark. With the fall of the Soviet Union, the State Department brought the couple home to spend 44 weeks learning Russian. In 1992, U.S. Ambassador Thomas Pickering asked Segal to join his team in Moscow to implement strategic and nuclear arms control and chemical weapon destruction agreements. A year later, Pickering asked the couple to open a U.S. consulate in Yekaterinburg to cover the Urals and western Siberia, an area half the size of the United States with about 40 million people. Home to the U.S.S.R.’s military-industrial complex, it had been off-limits to westerners for 70 years. Their mission: spread democracy and make contacts for American business opportunities. The diplomats got an immediate feel for what Siberia is famous for: The temperature was 40 below zero the day they arrived. 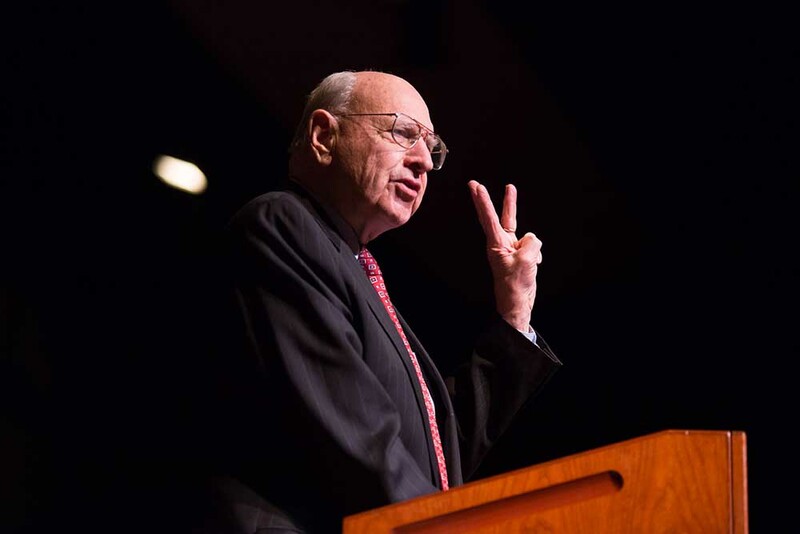 In November 2015 as the presidential campaigns heated up, Pickering came to Traverse City at the invitation of Segal and Puschel to speak in the IAF lecture series about the foreign affairs challenges the candidates would face in the 2016 election. There wasn’t an empty seat in Milliken Auditorium. After the 9/11 attacks, Segal spent nine years as an adviser to the top NATO commander responsible for Afghanistan, making 40 trips to the war zone from the couple’s home in the Netherlands. Meanwhile, Puschel was raising their only child, Jehan, and using her diplomatic and language skills to help lead a local humanitarian effort to bring impoverished Belarus children, victims of downwind radiation exposure after the 1986 nuclear meltdown at Chernobyl, to Amsterdam for health care. Puschel moved to Traverse City in 2010 to be close to her mother in Northport and was joined a year later by Segal. She liked the area and its schools for Jehan, now a student at Reed College in Portland, Ore. But she feared her East Coast-reared, globe-trotting husband might find Traverse City boring. So she sought out people whose intellectual curiosity might match her husband’s. She came across an interview with Traverse City native and author Doug Stanton about the release of his book “Horse Soldiers,” a bestseller about elite U.S. Army special forces who worked on horseback with Afghan troops and CIA agents to defeat the Taliban in Afghanistan after 9/11. She called Stanton and told him about Segal. The men soon became fast friends. On his final trip to Afghanistan, Segal was allowed to take one journalist and Stanton was it. Stanton said he witnessed Segal’s cool diplomatic hand. He recalls Segal piling into an armored van with the four-star general, bodyguards and a colonel. Segal wore a suit and tie, a flak jacket and military helmet in the scorching 100-degree heat. And he remembered his friend’s analytical approach in meetings, including with Afghan President Hamid Karzai in the ornate presidential palace in Kabul. And that’s what Segal has done, in Northwest Michigan as he had in Afghanistan. “He just has one of the most astounding capabilities to listen to different viewpoints,” said Stanton. He gives students extra credit for attending and reporting on what they learn at IAF lectures. Thursday, April 20: “Turkey at the Crossroads,” with Lawrence Mandel, U.S. Deputy Chief of Mission, Turkey, 2014-16. Thursday, May 18: “The Cybersecurity Storm Front,” with Sam Visner, senior vice president, general manager, cybersecurity, ICF International. Thursday, June 15: “Journalism in a Facts-Optional World,” with Dexter Filkins, award-winning journalist, author and writer for the New Yorker. Filkins has done noteworthy reporting on Iraq, Syria and Afghanistan. Go to IAF’s website, or call or email 231-995-1700 or ees@nmc.edu for more information. The World Affairs Council of Western Michigan in Grand Rapids is the bigger, older, better-financed cousin of the International Affairs Forum in Traverse City. Both are members of the World Affairs Councils of America, which bring international issues to communities across the nation. Executive Director Dixie Anderson said interest has picked up significantly since the November election. Average event attendance is up by about 50 people, approaching 300. With live streaming, the audience averages around 1,000. The group is supported by 60 businesses, many of which have global trade or operations, Anderson said. Monday, Mar. 20th: “Is it all Politics? Trade and U.S. Jobs,” with Jeremy R. Haft of Georgetown University and CEO of SafeSource Trading. Monday, Apr. 3: “Shifts in the Sand: U.S.-Saudi Relations,” with Simon Henderson, Washington Institute for Near East Policy, Washington, D.C.
Archived events: See past presentations of the World Affairs Council of Western Michigan. The group can also be reached by phone at 616-776-1721. 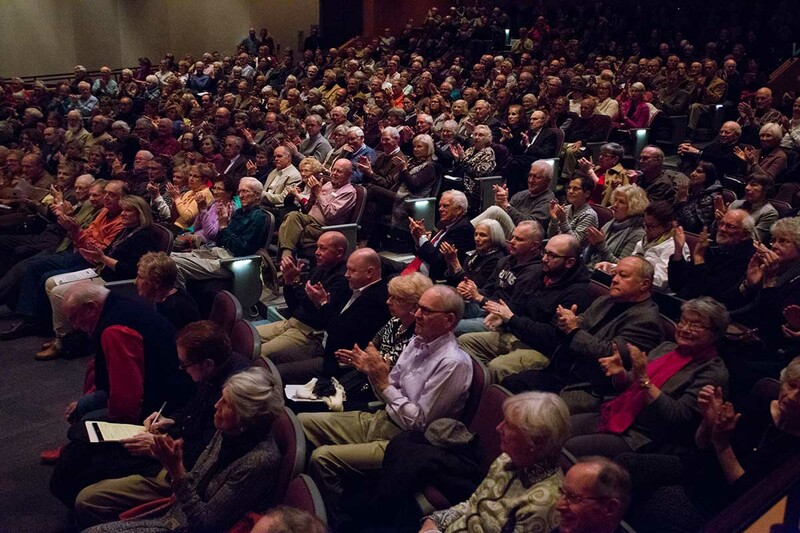 The Dennos Museum Center at Northwestern Michigan College is pleased to have been, and still is, the host of the International Affairs Forum lecture series since shortly after the Museum opened in 1991. The monthly lectures are held in the Dennos' Milliken Auditorium. In that time the Series has grown working in cooperation with Extended Educational Services and other areas of NMC which provide ongoing support to facilitate the programming the IAF Board brings to the community. The Grand Traverse area and NMC are indeed fortunate to have Jack and Karen leading this great organization, along with the IAF Board, to provide this important Series at a time when it is essential we have an informed public on important matters related to foreign affairs. What a wonderful feature story; thanks, Bob (exemplary of the quality reporting to which Bridge has a clear commitment -- and for which it has been recognized)! This couple is a true example of the collective "time and talent" we are fortunate to have among our retirees here in Northwest Michigan. Why does your wife look SO familiar? Resembles an actress on TV? Really adding to the conversation here (not), but maybe it has just been from her involvement all these years? Really great writing; some people just have that gift! Wonderful way to live your lives, as well. Thank you.